Tigers FC beat the FFA Centre of Excellence (COE) 5-3 at AIS midday on Saturday, thanks to goals from Stephen Domenici, Jeremias Ibarra and Nicolas Abot. Tigers FC had to bounce back after consecutive defeats to Canberra Olympic FC in both the Westfield FFA Cup Qualifying Final and their NPL PS4 matchup last weekend. The Tigers came into the game missing Julian Borgna, Alan Gaston and Daniel Barac through suspension and striker Alex Oloriegbe who recently transferred to Canberra FC. FFA COE weren’t coming into the game crash hot either with their talisman and leading goal scorer John Roberts out due to suspension and the home side had to recover from a last minute defeat to Gungahlin United last weekend. It wasn’t a good start for Tigers FC as five minutes into the match, midfielder Goran Josifovski came off with a knee injury and substitute Bradley Moore was called into the match earlier than expected. The stoppage in play didn’t help the away side as FFA COE had two close chances five minutes later through attackers Mirza Muratovic and Mark Moric but both shots were just wide of the goal. Not capitalising on their opportunities came back to bite the FFA COE as Tigers scored moments later thanks to a Jeremias Ibarra goal. A lovely cross in by fullback Osman Fofanah was headed in by Ibarra and opened the scoring for the Tigers. Frustration began to build ten minutes later for FFA COE, as some misplaced passes led to a Tigers FC counter attack that ended with striker Nicolas Abot being fouled in the box. PS4 NPL leading goal scorer Stephen Domenici made no mistake from the penalty spot and put the Tigers ahead 2-0. FFA COE were not going down without a fight and responded with a goal one minute later thanks to striker Mark Moric. The forward capitalised on a fumble by Tigers FC keeper Jakob Cole who couldn’t hold onto the ball after a Muratovic shot and Moric was in the right spot to tap in the rebound and made it 2-1. The comeback didn’t last long as ten minutes later Tigers FC striker Abot made a rampaging solo run through the FFA COE defence and smashed the ball in the net to make it 3-1. It was unlucky for FFA COE as the boys had some momentum going forward after their first goal. It went from bad to worse and Tigers scored again four minutes later courtesy of a Domenici goal. The star striker was played through the channel and despite FFA COE keeper Jordan Griffiths getting a hand on the ball, Domenici’s shot still went in and the Tigers finished the half up 4-1. The second half didn’t have a goal frenzy from the beginning like the first half and the FFA COE boys really stepped up their game trying to cause an upset on the NPL PS4 leaders. The home side had some close chances through Moric and midfielder Rahmat Akbari but were kept out by Tigers keeper Cole who made the clinical saves. Controlling the possession and some constant pressing by the FFA COE boys really began to disrupt the Tigers defence. It all paid off in the 75th minute when Muratovic crossed in a beautiful ball to Moric who smashed the ball into the back of the net to make it 4-2. Tigers who weren’t very convincing so far in the second half, came back three minutes later after Ibarra netted his double for the afternoon. The attacker was played through brilliantly by Domenici and slotted it in past Griffiths to make it 5-2. FFA COE would not lie down and came back two minutes later with a goal thanks to midfielder Louis D’Arrigo. Some great work by substitute Jaidon Seldon who made a superb cross in from the wing to D’Arrigo who made no mistake, smashing it into the top corner to make it 5-3 and gave FFA COE some hope of a comeback. Despite a late surge by the home side, Tigers FC held off in the end and came out winners with a 5-3 victory. The FFA COE boys should be proud of their efforts as they put up a good fight against the PS4 NPL leaders. A brilliant strike from young midfielder Sam Roestbakken settled the outcome at the very first PS4 NPL match to be played at Duncan Oval in Googong. The new facility, located just outside Jerrabomberra, was christened by an exceptional goal, Roestbakken taking aim and driving a low, unerring drive beyond the reach of the exceptional Woden-Weston FC goalkeeper Josh Wade after superb approach work by Mark Shields, the returning striker beating two men before laying off to Roestbakken for the killer blow. It was a win that the Panthers deserved, just about edging their opponents in general play and creating the better chances. Admittedly, most of the opportunities came when the visiting team were reduced to ten men following the dismissal of Bensah Afiabo for dissent midway through the second half. The loss of the influential Afiabo was a real blow for Woden-Weston as the front-runner had looked the most likely to equalise the early goal, going close twice in the second half in quick succession. The best opening came when Afiabo beat Nathan Alferink to a through ball and rounded the goalkeeper only to find the side-netting, on the stretch, from an acute angle. Alferink also denied Goran Milutinovic from point blank range and Jarryd Clifton also had a pair of presentable openings in both halves. Each time he failed to hit the target with his shot, the first effort flashing wide and the second blazed over the crossbar from a fairly acute angle after some good inter-play in the build-up had sucked in the Panthers outstanding defensive pairing of Chris Ruiz and Daniel Hearle, captain for the day on his final appearance before heading to the USA. But in the main it was Wade who was made to work the harder and the Woden-Weston FC goalkeeper was in inspired form. The ‘keeper really should have been given little chance in the opening stanza when Ed McCarthy missed from six yards and Darian McGarry-Watson, prior to an early departure through injury, passed up a great chance to add to Roestbakken’s opener. In the second half Wade, in rapid succession, denied midfielder Alan Murphy, Shields and Daniel Felizzi twice, making four sensational saves low down, plunging to deflect the ball away from danger on each occasion as the Panthers searched for a killer goal. That they couldn’t find one made for an entertaining and tense final few minutes but the Panthers held on for an important three points. Canberra Olympic celebrated their inclusion in the Westfield FFA cup Round of 32 by beating Belconnen United in their own back yard. On a freezing evening at McKellar Park, Olympic won this top four clash by two goals to nil. The first half started with Belconnen pressing and Olympic tentatively feeling their way into the game. The Devils moved the ball well down both flanks and Olympic were quick to counter, catching the home team back four high and a little square as both Michael Reeve and Phillipe Bernabo-Madrid broke in behind but were thwarted by scrambling defence. The first clear chance came to the home team when veteran Matt Valeri played in youngster Sam Smith who accelerated past Tim Bobolas on the Olympic right and pulled the ball back deep into the Olympic box were David Kemp was lurking unattended. His right foot finish flashed past Angelo Konstantinou's post much to the relief of the Olympic custodian. It was the visitors who were to break the deadlock after a period of sustained pressure. Jason Ugrinic coughed up cheap possession on the Belconnen right and Olympic were able to win a corner and then a free kick on the edge of the penalty area. Bernabo-Madrid stepped up and on 22 minutes Olympic were in front as his well-placed shot wrong footed Adam Perakovic in the home goal. Back came United and Ugrinic was presented with a golden opportunity to level when he was picked out in space at the far post but he blazed his left foot shot over the bar. Sam Smith was the next to threaten when he dealt expertly with a waist high cross only to see his close range volley cannon off an Olympic defender and away for a corner despite Belconnen claiming the use of a hand by the defender. Half time and Olympic in front. The second half started with the Blue Devils determined to get on the score board. In the first ten minutes Taylor Beaton, David Kemp and Sam Smith all had chances blocked by some resilient defending by the Olympic rearguard. Olympic then worked their way back into the game and Bernabo-Madrid had a goal chalked off for off side. Robbie Cattanach was given the freedom of McKellar Park but as Perakovic closed him down he clipped his shot against the base of a post. Belconnen failed to heed the warnings and, on 65 minutes, they were exposed again down their right. A clever delivery into the Belconnen area found the feet of Jeremy Habtemariam who calmly slotted the second and ultimate game sealer. Desperately seeking a way back into the match Belconnen through caution to the wind. Substitute Aisosa Ihegie was quickest to react to a loose ball in the area but his shot was wayward and after that Olympic saw the match out with some comfort and indeed might have extended their lead if a Josh Calabria free kick had not sailed just over the bar. Hawker football Centre was the venue for this lively NPL encounter and the young CU Academy team proved too strong for a lacklustre Gungahlin United running out 3-0 winners. The game began with CUA keeping possession and moving their opponents around the park with some excellent combinations. Jason Denham in the visitor’s goal was called into action early saving point blank as the home team continued their dominant start. Josh Gulevski, Tony Madaffari and Sam Whithear were all prominent in attack bringing excellent saves out of an overworked Denham in the away goal. Gungahlin for their part were content to play on the break and were dangerous with long balls in behind the CU Academy defence. On one such occasion Reagan Walsh narrowly missed connecting with a through ball and Sam Brown in the home goal managed to clear with his feet. The deadlock was broken in the 39th minute when Madaffari found himself in the clear and neatly finished past an advancing Denham. The second half was much like the first. Adrian Macor playing a more familiar midfield role was bossing the game and his lovely lobbed pass for Gulevski nearly brought a second. Gungahlin where not offering much as an attacking force but at 1-0 down might have fancied their chances of snatching an equaliser even if against the run of play. That hope proved forlorn as in the 70th minute Ridwan Hannan made it two. Finding himself free in the area he clinically finished past Denham and put the game beyond Gunners. The icing on the cake was provided in the 89th when substitute Bull Juach rounded off a fine move with a third giving CUA a comprehensive victory. 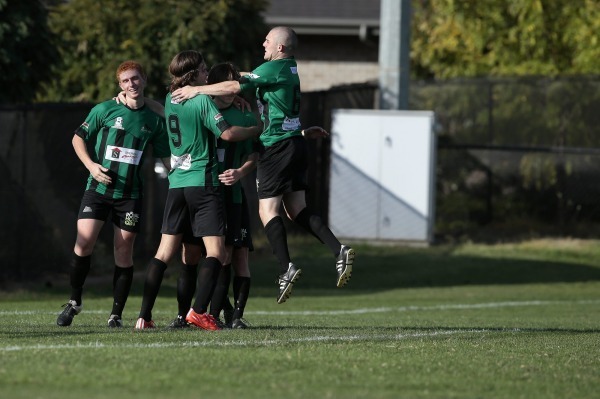 A turbulent last ten minutes at Deakin Stadium cost Canberra FC valuable ground in the Playstation 4 National Premier Leagues: Canberra on Sunday as a stubborn Tuggeranong FC side held them to a 1-1 draw. A goal for each side and a red card to Canberra FC’s Michael Mensah all inside the last stanza saw the game burst into life following an even previous eighty minutes. FC came out the stronger of the two sides to begin the match, but struggled to break down the deep-sitting defence of Miro Trninic’s side. Tackles flew in from both sides in a physical opening half, and the game’s first caution was handed out after 37 minutes. A Tuggeranong corner quickly turned sour, as Thomas James picked the ball up outside the area and dashed towards the Tuggeranong goal. Tuggeranong’s Aaron Cashman had other ideas however as he brought James down soon inside the half to draw the ire of the referee. The ensuing free-kick came to nothing and neither side could close out the half with a meaningful push, heading into the break with a goalless stalemate. The second period started at a faster click, with Alex Oloriegbe bursting down the wing just three minutes in before squaring to Kye Edwards whose shot was saved well by Josh Lagudah in the United goal. Just moments later the visitors had their best chance so far, as Nikolaos Kalfas broke past a couple of challengers and burst into the box before blasting wastefully over from close range. Just past the hour mark Mensah picked up his first caution as he brought down the marauding Marco Gayer in midfield. Tuggeranong continued to threaten on the counter as the game went on but Canberra FC came close from a corner in the 79th minute as Ivan Pavlak’s whipped ball took a touch and flew across the face of goal. Mensah was off three minutes later as he again brought down Marco Gayer, this time much closer to goal, and the visitors made the advantage count in the 85th minute. Kalfas was presented with an almost identical opportunity to his earlier miss, and this time made no mistake as he skipped into the box and rifled a shot over Rory Larkin and into the roof of the net. Trninic’s side appeared happy to wind down the clock as the minutes dragged on, only for the home side to implausibly grab the equaliser with a minute to spare as James free-kick was deflected into his own net by the unfortunate Aiodan Beatman who had otherwise enjoyed a superb match.